Some 8 percent of the of the annual sediment contribution delivered to the global oceans comes from the Greenland Ice Sheet. Greenland is rapidly melting. Blame it on climate change. This is no good news, but a new paper points out an unexpected benefit as a result of all this lost ice: sand. The world is in need of sand—in part, to prepare for rising sea levels and strengthen coasts—and Greenland could play a major role in supplying it. This paper, which isn’t a study but rather a perspective in the journal Nature Sustainability, is the result of a separate study the authors published in 2017 after they realized that parts of this semi-autonomous Danish territory’s coastline were growing. After popping information on ice sheet melt into models, the team realized the growth of sandy river deltas was directly related to the loss of ice. Greenland’s ice sheet has been losing an estimated 269 billion tons of ice each year since 2002. 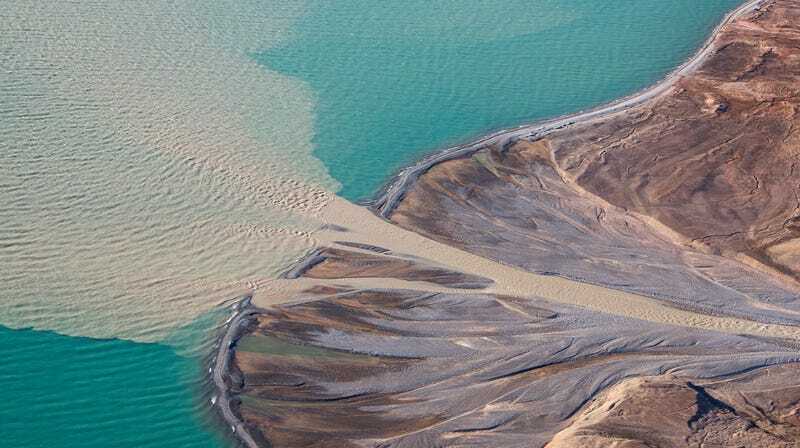 This has resulted in sand building up on the island’s coasts because as the ice melts, it flows through rivers and carries sediments toward the sea. The sand delivered to Greenland’s coasts each year has a market value equivalent to more than half of the government’s gross domestic product, which was about $2.22 billion in 2015, per this press release. The paper doesn’t say how much more sand could result from further melting in the future, but the amount is expected to rise as the ice sheet continues to melt. There is currently an abundance of sedimentation occurring on the island’s southwestern coast, in particular, and along the northeastern coast. The paper also doesn’t do a proper economic analysis to see whether any economic boom from a sand industry—in the form of jobs and sand exports—will counter the negative economic outcomes that’ll hit Greenland from climate change. Instead, the authors wanted to raise the question so that the Greenlandic government can take a closer look. “It’s kind of like we’re handing over this idea to policymakers,” said Bendixen. Climate change is here, and people in the Arctic are feeling its impacts already. Greenland’s economy currently relies tremendously on fishing and mining. Mining sand, too, could help diversify its revenue streams, argues the paper. The giant island holds a small population with just over 56,000 people calling it home—and that population, which is largely indigenous, is shrinking. “We believe the Greenland population actually has excellent skills for this industry,” Bendixen told Earther. However, diving into the world of sand will require some important environment analyses. This is still a form of resource extraction and mining—and in an area of the Arctic that has largely been left untouched. Removing sediments from the water could further disperse them, harming local ecosystems. If Greenland does decide to embark on this sandy journey, its sediments may wind up on beaches destroyed by hurricanes. Superstorm Sandy left Coney Island’s beaches devastated, and officials needed more than 2 million cubic meters of sand to rebuild, per the paper. Beyond coastlines, sand and gravel also goes toward road and railroad fill. In fact, these are the most mined substances in the world, with the 40 billion tons extracted every year amounting to roughly twice what’s carried by all the worlds rivers. “The world is in need of sand, and you have so much more sand here,” Bendixen told Earther. Greenland’s sand may be the key to helping rebuild as natural disasters and rising sea levels erode coastlines. Now if only it wasn’t also contributing to the sea level rise problem.